University President Morton Schapiro speaks to new students in September 2016. 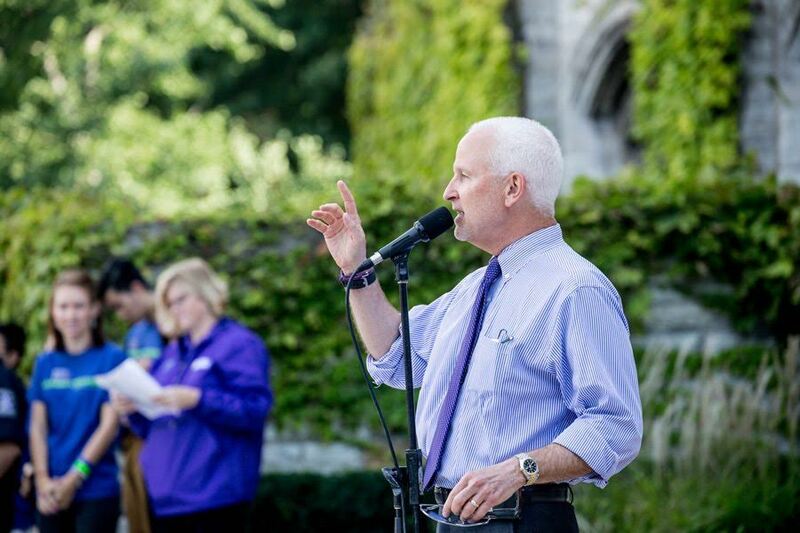 After President Donald Trump moved to end the Deferred Action for Childhood Arrivals program, Schapiro pledged Northwestern’s continued support to undocumented students in a Tuesday email to students. University President Morton Schapiro stressed the importance of protecting undocumented students in a Tuesday email to students, condemning President Donald Trump’s decision to end the Deferred Action for Childhood Arrivals program. DACA, created through an Obama-era executive action, protects “Dreamers” — undocumented immigrants brought to the United States under the age of 16 — from deportation. Since 2012, nearly 800,000 people have been approved for the program, which defers deportation and allows them to live and work in the U.S. for renewable two-year periods. On Tuesday, Attorney General Jeff Sessions announced that Trump plans to end the program by March 2018, meaning Dreamers could be at risk of deportation once their current deferral periods expire. NU’s Associated Student Government also released a statement condemning Trump’s decision, calling it a “crushing blow” to undocumented students. The statement said ASG will work with administrators and Evanston officials to provide resources to undocumented students. Schapiro called Trump’s decision “deeply disappointing,” and said Northwestern would continue to support the safety of all students and offer “special assistance” to undocumented students with legal questions. He also confirmed that the University would continue to increase financial aid for undocumented undergraduates. Schapiro said in the email that the University would communicate its position to the Administration and to Congress through letters, petitions and collaboration with academic organizations including the Association of American Universities. He urged Congress to seek a legislative answer to immigration issues in the absence of DACA. “There can be no question that it now is time to find a humane, just solution to this pressing societal issue,” Schapiro said.